Poll: Would you like to be able to speak more Irish? 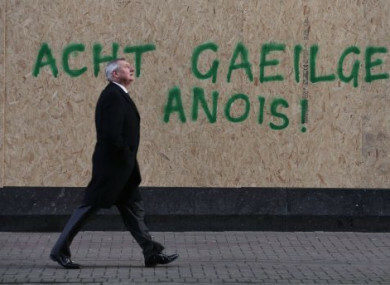 Graffiti on a wall in Belfast calling for an Irish Language Act in Northern Ireland. WITH THE COLLAPSE of the Northern Ireland executive talks and speculation about gaelscoileanna carrying out pre-interviews with young children, there has been a lot of talk this week about the Irish language this week. The 2016 Census showed that 1.76 million people in the country can speak as Gaeilge, but only 73,803 people said they speak it every day (outside school) and just 8,068 Irish language Census forms were completed. Lots of us have those cúpla focal but not enough to get by. What about you? Would you like to be able to speak more Irish? Email “Poll: Would you like to be able to speak more Irish?”. Feedback on “Poll: Would you like to be able to speak more Irish?”.